We have always been drawn to the beautiful cape region of South Western Australia. 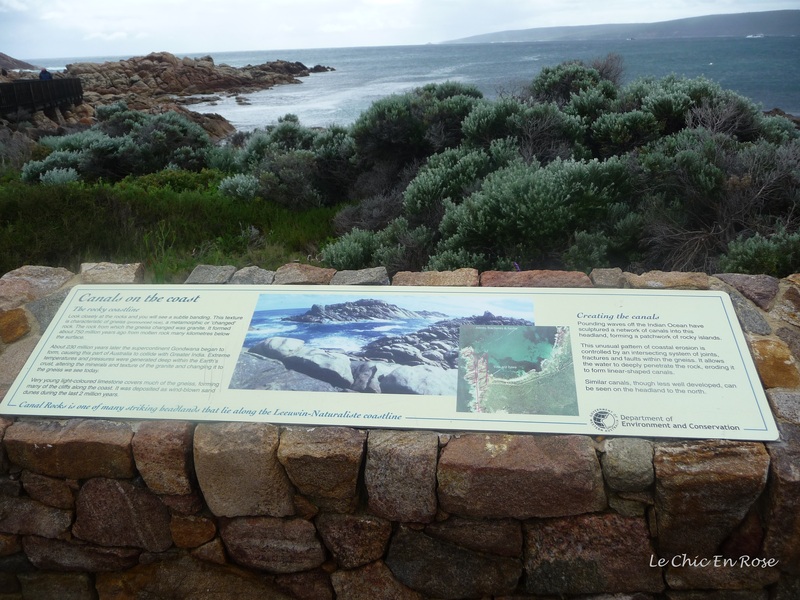 The Cape Leeuwin Naturaliste Park covers the area from the lighthouse at Cape Naturaliste in the north to the Cape Leeuwin lighthouse in the far south west. There is quite a contrast between the more serene waters and sheltered bays of Geographe Bay in the north (see Sunset At Cape Naturaliste) and the coast round the corner from Cape Naturaliste lighthouse. Here the powerful seas and wild winds have given this western coastal area an almighty battering over the years. The beaches are a magnet for the many surfers drawn to the magnificent swell (for experienced surfers only!) and visitors who come for the coastal walks and trails and to admire the ocean. We used to visit Canal Rocks when our 2 daughters were small and have been coming back ever since. The aboriginal name for the rocks is Winjee Sam. The seas and wind have carved an unusual rock pattern into the granite rocks and formed a series of channels or canals. Nowadays a series of wooden walkways and bridges allows you to walk up to the end of the channels and witness first hand the power of the ocean with the waves crashing onto the rocks. 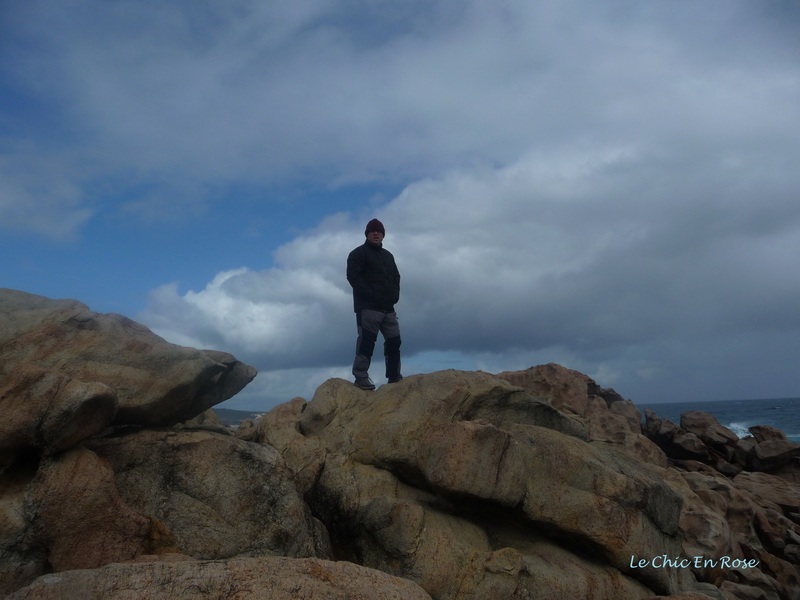 Monsieur Le Chic rugged up though we have been there when it was wilder! Common sense is required – we have been there on several occasions when the water is breaking over the pathways and you have to be careful not to slip! On the day we were there recently it was comparatively mild and yet you can still see the immense power of the ocean in full force! 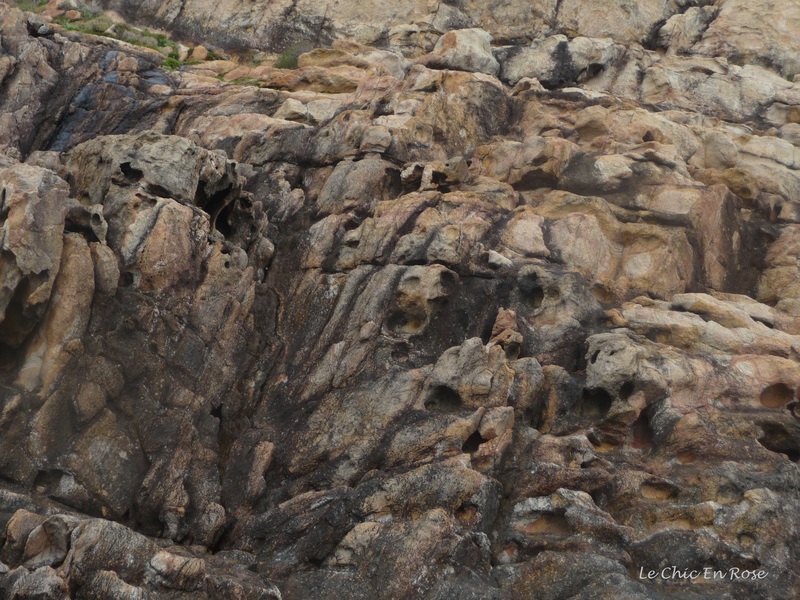 The rocks themselves are fascinating – intricate patterns have been carved out into the granite over many centuries. We were there at the very start of spring and wildflowers were starting to bloom. On the other side of the rocks away from the walkway and channels you can get a good vantage point of the sea. Monsieur Le Chic couldn’t resist climbing all the way to the top (be careful if you decide to do this!). Monsieur Le Chic at the “top of the mountain”! Whilst I waited a bit further down he managed to take some fantastic photos of the sea crashing over the rocks below! For more wonderful walks around the world head over to Restless Jo’s Monday Walks! 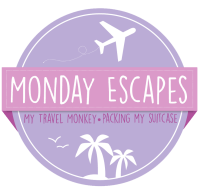 And for even more travel ideas head over to Allane and Ting at their Monday Escapes! Thanks Suzanne – yes I love walks by the sea too! There is something so special about the ocean – I could watch it for hours. Happy the photos came out – it was a wild and blustery day! Gorgeous! Nothing better than a coastal trail. Just gorgeous Rosemary, the waves mesmerize me too, nothing better than watching huge breakers crash onto the shore, these look just perfect!! Love the wooden boardwalks too, definitely my kind of walk. Thanks Joy it is such a lovely and unspoilt place 🙂 The sound of the waves crashing down is wonderful too – pity I can’t add a sound button to the photos (perhaps I should video them next time). There are also lots of rock pools with little crabs in them – our girls loved fossicking around there when they were younger! The boardwalks make it possible to walk further out to sea than you could safely do otherwise – the waves are huge!! I should have taken some photos of the rockpools Joy – we saw quite a few black crabs it was always a game when our girls were younger to spot them! We are having a lovely spring day though it’s chillier at night (still cool enough to light the wood fire so I’m happy!). My dad said it was quite pleasant yesterday in Yorkshire so hope it is with you too! AMAZING! I would love to stay there for hours just watching the waves crashing. Don’t worry, things have been pretty busy around here too. What a fun adventure – I like the patterns on the rocks! Thanks Meg – the rocks are fascinating aren’t they? It looks a bit like a modern sculpture but it’s been created by the force of the sea over the centuries! Looks so beautiful! I often say that I prefer big cities over nature and smaller places, but when I see pictures like this, I’m not so sure. That looks so wild and exciting. Your photos really capture something of the feeling of being there. I can almost hear those waves crashing.